A FETN protester throws red paint at the statue of Taiwan's former president in Chiang Kai-shek Memorial Hall. As transitional justice moves forward in Taiwan, references to its authoritarian past are being removed or vandalized. 2018 may be considered the “year of the vandal” in Taiwan, if statues of former president Chiang Kai-shek are any metric. The island is in a period of transitional justice, and as excesses and abuses of its authoritarian past are being investigated, former President Chiang Kai-shek is undergoing something of a performance review. From a grassroots perspective, the verdict doesn’t appear good. Vandalism of Chiang’s image isn’t anything new to Taiwan. Liberalization and democratization have allowed a public debate on the island’s past. From time to time symbols of Taiwan’s past dictatorship become a target when that debate manifests into a physical form. In the past couple of years, the rate and audacity of vandalism of Chiang statues has grown, particularly since the 2016 elections, when the island voted Chiang’s Chinese Nationalist Party, the Kuomintang (KMT), out of power. For the first time in Taiwan’s history the party responsible for martial law and the White Terror period is under heavy scrutiny and powerless to prevent inquiries from the independence-leaning Democratic Progressive Party (DPP), which won power in the presidency and the Legislative Yuan. The DPP has pushed for investigations into the opaque activities that occurred under the KMT’s period of single-party rule. In December 2017, the DPP passed the Transitional Justice Act, mandating the removal of authoritarian symbols, including the dismantling of remnants of Chiang’s cult of personality. Streets and schools were to be renamed and public statues and symbols uninstalled. 2017 was the year Chiang’s statues were noticeably targeted more by vandals. Did the act help to galvanize more grassroots acts in 2018? In addition to myriad smaller statues being targeted with eggs, red paint, and graffiti, there were some particularly notorious cases in the last two years. On February 28, 2018, the 71st anniversary of the deadly 228 Incident, Chiang’s sarcophagus was doused with red paint and the mausoleum occupied by protesters. In July, the Chiang Kai-shek Memorial Hall in Taipei’s Zhongzheng District was targeted. 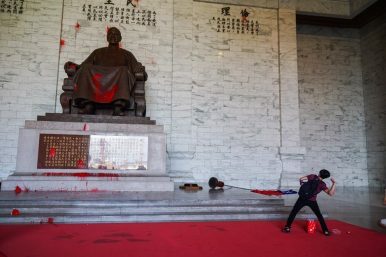 Red paint – meant to represent the blood of victims under the KMT’s martial law period — was thrown across both the seated statue of Chiang and the nationalist emblem outside. In September 2018 a court case involving the perpetrators behind the beheading of a Chiang statue in April 2017 was thrown out on a technicality. Groups responsible for vandalism have all called for greater transitional justice. The 228 Incident, spoken of only in whispers during the martial law period, was a violent island-wide suppression of uprisings against KMT maladministration ordered by then Governor-General Chen Yi. The massacres began in Taipei on February 28, 1947 after a cigarette peddler was beaten by tobacco industry enforcers. Riots sprang up across the island, and the ensuing crackdown continued for several weeks; Nationalist soldiers marauded across the island, leaving an estimated more than 20,000 Taiwanese dead. George H. Kerr, an American diplomat in Taipei during the time, paints a frightening and sickening picture of a carnival of violence in his Formosa Betrayed. Chen was later executed in Taipei in 1950 as a public relations stunt, but it did little to improve conditions on the island. The tide against Chiang has been so strong in recent years that even some students at National Chengchi University in Taipei, the political university established personally by Chiang himself as a school specifically for KMT officials in Nanjing in 1927 (and re-established in Taipei in 1954), lobbied administrators for his statue to be removed from the library. An equestrian statue of Chiang Kai-shek stands watch over the gates of National Chengchi University in Taipei. Photo by James X. Morris. The debate over where Chiang fits into Chinese and Taiwanese history has many factions. Some believe he was the only leader capable of holding off an invasion of Mao’s People’s Liberation Army in the 1950s, and without martial law the island would have been infiltrated by saboteurs. Some argue Chiang was a distracted adventurist who got in over his head, which cost him China. Others believe he was a leader who was given a bad hand repeatedly and could only play the cards he was dealt. Kerr wrote how many Western governments were prepared to write Chiang off in the late 1940s, their consular offices in China anticipating a Communist takeover of the mainland and eventually Taiwan. The Korean War helped Chiang’s fortunes. Despite his wartime nickname “Cash My Check,” in Washington there existed a significant Taiwan lobby, and Chiang’s wife, U.S.-educated Soong Mei-ling, was his strongest diplomatic asset. The Truman Doctrine of containment demanded Chiang’s Republic of China could not fall to Mao. At the end of World War II, Taiwan came under the control of the Republic of China, headed by Chiang. Kerr writes about the initial excitement of Taiwanese to become a leading part of the new China. Prior to 1945 they had been living modernized lives as part of the Japanese Empire. At the retrocession of Taiwan to the mainland, Kerr describes Taiwan as the only place in all of the Republic of China where one could find elevators. The hopes of the Taiwanese were soon dashed as carpetbaggers from the mainland seized authority over the island’s industries, self-rule was revoked in favor a special KMT-dominated Governor-General administration, and infrastructure and wealth on the island was plundered for a failing war effort. After less than two years under the Nationalists, protests led to the 228 Incident. In 1948, the Nationalists placed all of mainland China under a general martial law. This was extended to Taiwan in 1949 in preparation for the Herculean task of evacuating some 2 million Nationalist soldiers, officials, and elites from the mainland to Taiwan. The mainland was lost, but for the 2 million mainlanders, Chiang was a hero. For the next 38 years, as the Taiwan Strait remained a flashpoint, Taiwan remained under martial law. The White Terror, a period coterminous with military rule, saw the arrest and imprisonment of more than 100,000 on the island and the executions of an estimated 3,000 to 4,000. Native Taiwanese and mainlanders were both targets. Disappearances under martial law were common, and memories of late night knocks on the door and the sounds of firing squads along riverbanks are still very real. A major obstacle to enacting true transitional justice is the sensitivity of the KMT toward prying into their past role as the party behind the abuses. The modern KMT has done a lot to distance itself from the authoritarian period, but until 2016 was still in a position of power to prevent deep investigations. Local elections are now just around the corner. Despite their loss in the polls two years ago, the KMT still enjoys popular support across Taiwan. Should 2018 see the DPP maintain its electoral holdings at the local level, then the government will have a mandate to continue investigations into abuses during the martial law period. But should Chiang’s legacy be completely erased? Can it be? For good or ill, Chiang’s period of authoritarian rule and martial law have left an indelible mark on Taiwan’s social psyche. It is ingrained into the island’s story. Chiang Kai-shek Memorial Hall and Liberty Square in October, 2018. The hall draws many international tourists and features several museums and exhibition halls. Photo by James X. Morris. It has been 71 years since the 228 Incident, 69 years since martial law was declared, and 31 years since it was lifted. Today, many Taiwanese find themselves related to at least one person who evacuated to Taiwan in 1949. In 2000, Taiwan elected its first DPP president, Chen Shui-bian. During his eight years in power, Chen implemented the first sweeping transitional justice policies and began tearing down the cult of personality surrounding Chiang. The plaza in front of the enormous Chiang Kai-shek Memorial Hall in central Taipei was renamed Liberty Square. The building itself was renamed, and the statuary hall was shuttered. KMT President Ma Ying-jeou (2008-2016) reverted the hall and its name back after taking office. Today under DPP rule, there are now plans to repurpose the hall yet again. On the other extreme, after his death in 1975, some communities began worshiping Chiang as a deity in the pantheon of the popular Chinese folk religion found on Taiwan. Chiang would likely be appalled, as he converted to Methodist Christianity as a young man. However, in a few centuries from now he may be lionized in folk tales as a heroic general who struggled in vain to reunite a fractured China as best he could. Chinese figures have been deified for less. Tucked away in a corner of Taipei’s bustling Guanghua electronics district, a large bronze bust of the former Chinese Nationalist leader stands in front of a restaurant. Seemingly out of place, it appears to have been rescued from a public institution somewhere on the island. The restaurant is run by a history enthusiast, and is decorated with photos and artifacts of Nationalist figures. Miniature busts of Chiang are everywhere. Is this the future of Chiang in Taiwan? A bust of Chiang Kai-shek welcome guests outside a restaurant in Taipei. Tourists and history buffs may soon find that private collections, museums, and themed locations are the remaining locations to view artifacts of the former Nationalist president’s time in power. Photo by by James X. Morris. Most of Chiang’s statues are relocated to the grounds of his Cihu mausoleum in Taoyuan City, southwest of Taipei. There they stand or sit, surrounded by lakes and hills as silent sentinels. As more measures of the Transitional Justice Act are implemented this landscape will become more crowded. Other statues will go into the hands of collectors, or otherwise be turned into tourist curios. Nearly every city in Taiwan has a street or district named after Chiang; erasing his influence would mean the history written into the island itself would change. The upcoming midterm elections will tell whether or not the island’s social pendulum is still in mid-swing, or on the return. 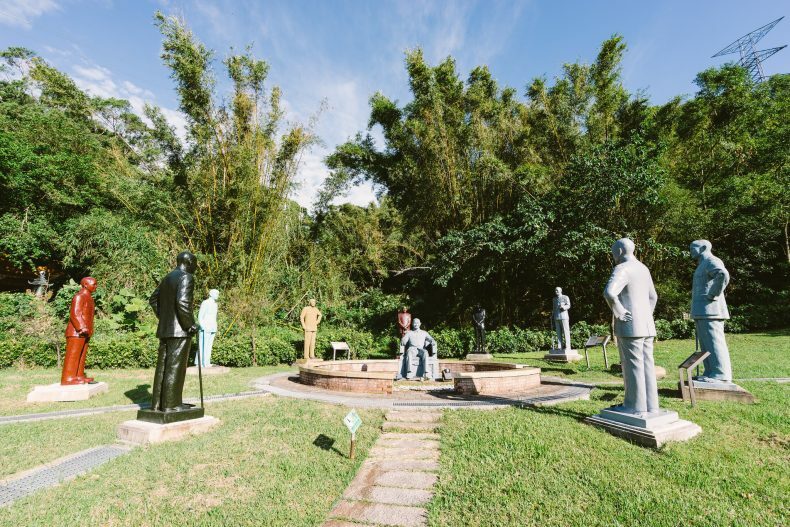 Statues of Chiang Kai-shek populate Chihu Memorial Park. Photo by Wei-Te Wong.